Zazie nel Metrò – C’est où Zazie? Directly out of Raymon Queneau’s book, or for the movie aficionados amongst you, out of Louis Malle’s film. “Zazie dans le métro”(or Zazie in the metro in Anglo-Saxon) tells the beautiful story of 10-year old Zazie who dreams of seeing Paris through the windows of its metro. The owner, who had lived in Paris for 3 years and presumably lived the dream of little Zazie, opened up this little bar in 2011 in homage to this wonderful movie and bringing a little Parisian wind to Rome. 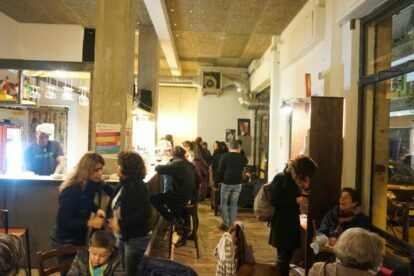 When this historic “baretto di quartiere” (neighborhood bar) in the Pigneto neighborhood shut down to move to a new, bigger habitat, we all went through some rather rough times. But now that it’s finally reopened it’s bigger and zazier than ever! Et voilà!…Zazie is a lovely, unpretentious bar my friends and I go to frequently. It’s perfect for spending a nice, relaxed evening whilst enjoying “a” (figuratively speaking) good glass of organic wine or some excellent craft beer. For some weird reason I also think of Zazie as the perfect place to spend your evening when that certain desire for philosophizing about cabbages and kings comes up. But then again maybe that’s just because we do that most of the time. I also come here often to have some breakfast (yes we have our breakfast at bars in Italy), enjoying freshly baked croissants and coffee. Plus the new Zazie also has a little stage where you just might get to relish some local artists.